Everyone probably knows Dwyane Wade is an American professional basketball player who has played in the shooting guard position for NBA’s Miami Heat and Chicago Bulls. Since we all know the man, let’s start off with the lesser known facts about him. You probably don’t know that Wade is regarded as one of the best-dressed men in the world. He was named and honored alongside the likes of Barack Obama, Nicolas Sarkozy, the former President of France and other leaders across the world for this in 2006 and 2007. Before that, the basketball star was named in People Magazine’s 50 Most Beautiful People. But, greater than that, Dwyane has a beautiful heart. He has been actively involved in promoting human welfare. To cite an instance, Wade reacted to the 2010 Haiti earthquake with huge compassion. He co-founded Athletes Relief Fund for Haiti which raised over $800,000 for the victims 3 days after it was launched. While you wouldn’t be bothered with other instances of his humanitarian benevolence, you should know that Wade takes his Christian faith very seriously. He loves playing with the number 3 jersey because it reminds him of his faith’s Three-In-One God (Trinity) doctrine. Wade was one of those kids with a difficult upbringing. Born in a gangster-ridden area of South Side Chicago, Illinois on 17th January 1982, his parents separated when he was just 4 months old. As a young child, Wade was already an eyewitness to several gang violence and police raids. His mother’s drug addiction and involvement with drug kingpins only worsened the situation. To escape the misery, his older sister Tragil tricked him into believing they were going to see a movie but actually took him to live with their father in a different less-violent area of the neighborhood. Wade was 8 at the time. His father who was a retired Army sergeant remarried a year later and moved the family to Robbins, Illinois. In Robbins Illinois, Dwyane started his journey to a successful NBA career. He turned to basketball to overcome any chance of involvement with gang violence. He often played with his older stepbrothers and new friends under the tutelage of his father who at the time was coaching a local recreation center. Later, Wade enrolled in Harold L. Richards High School in Oak Lawn and continued playing basketball. He found success with the varsity team and even became its star player, but the major break didn’t come until after much hard work and a 4-inch increase in height. Despite setting records at Harold High, Wade’s poor academic performance gave him only three college recruitment chances. He settled for Marquette University in 2000. After sitting out the first season due to academic problems, Wade debuted in the 2001/2002 season and later lead his team to her first-ever Conference USA championship. Wade’s success in basketball only increased from that point on. He had to forgo his senior year to enter the 2003 draft. He was selected Round 1, 5th overall by the Miami Heat and his success continued. Together with fellow rookies LeBron James, he received a unanimous selection to the 2004 NBA All-Rookie Team. Wade’s star shone brighter following the departure of Shaquille O’Neal who was the team’s star player at the time. The star played his first NBA finals game in the 2005/2006 season against Dallas Mavericks. It was the first NBA final in the history of the Miami Heat, and not only did they snap the championship trophy, Wade received the Finals MVP trophy. The player went on to win two other championships with the franchise in 2012 and in 2013 reaching the finals in 2014. Wade was part of the 2008 Olympic NBA unbeaten team that defeated the world champions, Spain to snap the gold medal. Also, he is Miami Heat’s all-time leading scorer. Unfortunately, his 13-year love story with the side ended in 2016 after he signed a two year $47.5 million contract with Chicago Bulls to much dismay of fans. Wade explaining his reason said that he felt unwanted and unappreciated by Pat Riley, Miami Heat’s President. Wade’s first salary for playing for the Miami Heat was $2.6 million. As his career progressed so did his paycheck; in his last year with the franchise, his salary was $20 million following a two-year, $31.1 million contract he inked in 2014. From 2002 to 2016, Wade has made over $138 million in salary alone. Like LeBron James, Wade employs the method of signing short-term deals in order to increase his flexibility and allow room for better annual deals. His new deal with the Chicago Bulls leaves his annual salary for the next two years at over $20 million. Beyond his earning from basketball, the star has businesses and endorsements that he equally earns from. He boasts of about 15 endorsement partners including Gatorade, Pepperidge Farm, Hublot, Mission and Naked Band Group. In 2015, Forbes calculated his earnings from endorsements at $12 million, bringing his total earnings for the year to $32 million, making him the 6th highest paid player in the NBA for the year 2016. Naked Brand Group is set to launch a Wade-brand line of underwear beginning in 2016. Meanwhile, the player sold his own line of branded Nike sneakers until 2012 when he left them to sign a long-term deal with Li-Ning, China’s sports accessory company. The deal included over $60 million worth of equity stakes in the company. In addition to his plethora of endorsements, Wade owns a socks and neckties line. Together with endorsements and other businesses, Wade has made over $200 million in career earnings. The NBA star owns a $10.6 million mansion on La Gorce Island. It is a 13,000 square foot Mediterranean-style home with 6 bedrooms, a pool, and a private dock. His wealth is estimated at $110 million. Dwyane Wade is married to Gabrielle Union, the popular American actress known for her romantic comedy films. She was once married to former NFL player, Chris Howard. They met in 1999, married in 2001 and fell apart in 2005. Following the divorce, Wade and Union became lovers in 2009. They were having a good time together but couldn’t get to spend more time together due to their careers; so they parted. This happened sometime in 2013. To fill the gap Gabrielle left, Dwyane got pretty close with his childhood friend, Aja Metoyer. As life would have it, Aja became Wade’s baby mama. She gave birth to the player’s son, Xavier Zechariah on the 10th day of November 2013. The next month, December 2013, Wade and Union figured out how to fix their affair. With that, they got engaged and eventually, became life partners on 30th August 2014. In her book – We’re Going to Need More Wine – Union disclosed that she’s had no fewer than 8 miscarriages. Despite this, she and Wade are still working towards having a baby. 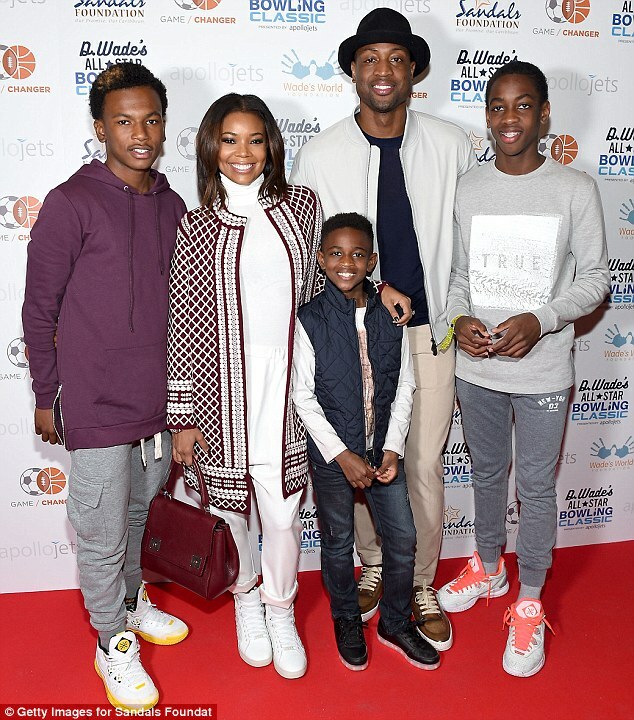 Nonetheless, she is a stepmom to Xavier and the two sons (Zaire Blessing Dwyane Wade and Zion Malachi Airamis Wade) the basketball player had with his first wife, Siohvaughn Funches. She was Dwyane’s high school girlfriend. He married her in 2002 and first expressed his intent to part ways with her in 2007. They had a long court fight but eventually, got divorced in 2010.